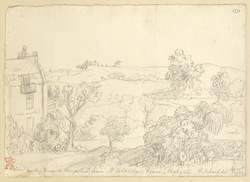 The footnote to this drawing states " View looking towards Hampstead from Mr Coleridge's Room, Highgate". This refers to the house of Dr James Gillman, where the poet Samuel Taylor Coleridge resided for the last eighteen years of his life. The drawing was made at the time of the poet's death in the summer of 1834.